WORKHEAD CAN BE ADJUSTED LENGTH WISE SO THAT MINIMUM DISTANCE FROM WORK HEAD SPINDLE FLANGE TO FORWARD POSITION OF WHEEL SLIDE IS 21" AND MAXIMUM DISTANCE IS 44". CROSS ADJUSTMENT OF WORK HEAD (FORWARD) : 16"
CROSS ADJUSTMENT OF WORK HEAD (REAR) : 14"
WHEEL HEAD CROSS TRAVEL : 8"
WORK HEAD MOTOR: ( 4-SPEED GEAR REDUCTION ) 2.5 - 7.5 HP. HYDRAULIC PUMP MOTOR: 2 HP. ESTIMATED NET WEIGHT: 24,000 LBS. INTERNAL GRINDING SPINDLE ( 16" QUILL LENGTH WITH INSTALLED 11" LENGTH QUILL EXTENSION TOTAL: 28"
SEPARATE (BAFFLE TYPE) COOLANT TANK & PUMP. 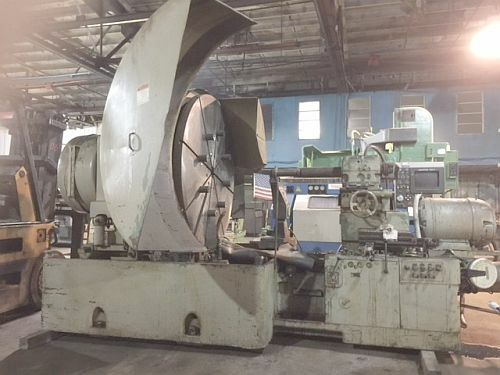 NOTE: THIS MACHINE IS A VERY RARE EXTRA LARGE CAPACITY HORIZONTAL DESIGN HYDRAULIC I.D. GRINDER AND SHOWS LOW USE ON ALL SQUARE BLOCK WAY AND WAY BEARING SURFACES.